Up to 400 post-primary students from across the Diocese of Kerry gathered together for a celebration day in the Brandon Hotel, Tralee on Wednesday, 27th March, 2019. All post-primary schools in the Diocese of Kerry were invited to participate in ‘Ceiliúradh na nÓg.’ The purpose of this initiative is to develop the faith life of Transition and Fifth year students. This was achieved through school or parish based initiatives. Ceiliúradh na nOg forms part of a comprehensive approach to Youth Ministry initiated by the Diocese of Kerry. It is coordinated by the Diocesan Advisor in collaboration with the principals, teachers, chaplains and students of the diocesan Post-Primary schools. For the academic year 2018-2019, the programme was carried out through a number of stages. The students actively participated in a faith based programme of exploration, action and reflection. As noted above, some schools choose a parish outreach programme such as visiting a nursing home, getting involved with parish liturgy groups or helping the elderly. Some schools choose to partake in school centred projects, for example, preparing school liturgies throughout the year or helping organise the school choir for various liturgical events. Mr. Philip Mulryan was this year’s guest speaker. Fr Philip Mulryne OP was ordained a Dominican Priest on 8th of July 2017. Previous to his entering the Dominican Order he had spent thirteen years as a professional footballer in England. He left home, which is Belfast, in 1994 and spent six years playing for Manchester United Football Club. After six years at Norwich City football club he decided to take a year out of football and returned home to Belfast. It was in that year that he rediscovered his faith and the vocation to religious life and Priesthood. At present he is a Chaplain to Newbridge College, Co. Kildare. 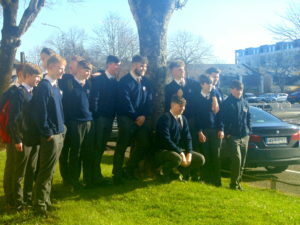 Students presented a three minute presentation on their project, they were also interviewed by Deirdre Walsh of Radio Kerry who performed as M.C. for the day. Bishop Ray Browne presented his address and later presented the certificates of achievement. 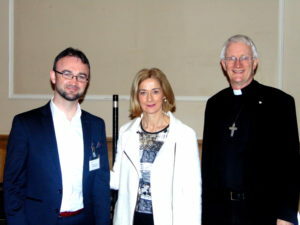 The day also includeed a number of faith based workshops which included presentations by members of the Diocesan Justice, Peace and Integrity of Creation Group, input from Trócaire and the Siamsa Tire, workshops on music and dance presented by various artists. There were also sessions on Christian Meditation, Christian mindfulness and scripture. The Kerry Diocesan Youth Service and Mr. Tommy Maloney facilitated fun workshops in the afternoon. I have found Ceiliúradh na nOg to be a worthwhile and beneficial project for my 5th Year students. It provides direct and hands on involvement in faith based topics that really appeal to students of all abilities. It is a well-designed faith development project which will allow one to create a programme of exploration, action, reflection and presentation to suit your students and develop their skills in these areas. It provides great opportunities for group work, peer assessment and faith development in an interesting and thought provoking way. It allows students to explore their own faith in a new and challenging way while developing their group-work, presentation, analytical and research skills.